One of the biggest trends this season is definitely the gingham print. You can spot dresses, tops, bikinis and even shorts and skirts with this print. At first, I wasn't really sure about this style, however I really fell in love with it now. I actually found this top, when I was cleaning my closet and I couldn't believe I didn't wear, because it looks perfect - I love the print, I love the off-shoulder style and I also love that it's a little shorter, which is perfect for summer. I wore this top yesterday during my visit of Prague. I combined it with a pair of white, high waisted skinny jeans and a pair of lace-up heels. 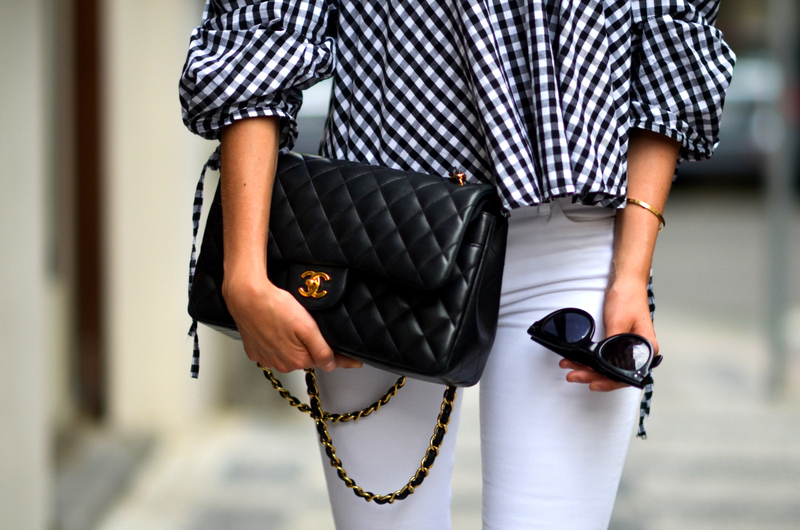 I have added my Chanel Flap Bag and also my Celine sunnies, which I love! It's been a while since I wore an black-and-white outfit, however I have to say that I really love this outfit at the moment - so what do you think? Are you a fan of this look? Dneska mám pro Vás outfit, který jsem měla na sobě včera. Kostičkovaný potisk se stal jedním z hlavních trendů sezony a já se bez mučení přiznám, že jsem mu propadla. Líbí se mi jak kostičkované plavky, sukně, tak i topy, a obzlášť pokud jsou "off-shoulder". Jeden takový mi přišel nedívno a tak jsem se rozhodla ho zkombinovat s bílými skinny džínami a šněrovacími podpatky od Stuarta Weitzmana a kabelkou Chanel, která je pro mě naprostou klasikou. Outfit jsem doplnila zlatými doplňky a samozřejmě brýlemi Céline, které jsou pro mě jedničkou již několikátým rokem - tak jak se Vám look líbí? A jste fanouškem tohoto stylu? love this top and your shoes are amaze!!! Dear you look amazing, great outfit! This look is perfection. I love that you found this amazing top in your closet it is beautiful. You're looking so charming! Lovely top!